Kids will love a petting zoo party for their next birthday. Create a petting zoo birthday party at your home or a nearby farm. 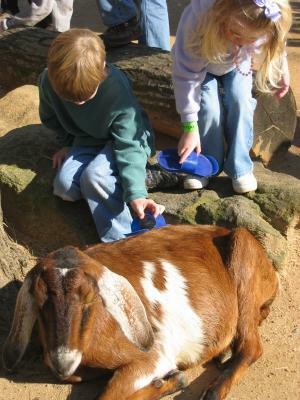 Focusing on one aspect of the petting zoo can help unify the entire event. Home parties might need a little extra decoration to make the theme come alive and having a narrower scope will help create the right atmosphere. A petting zoo can be easily set up at your home for a child's birthday party. Mobile zoos can be found from local parks, ranches and farms. They often bring in 10 to 30 animals in a trailer. Collapsible fencing or pens are used to contain animals. Handlers and keepers usually take care of all set-up and tear-down, animal food and rides. For petting zoos that have to be held indoors, a more narrow selection of animals can be brought in that are perfect for an enclosed space. Chinchillas, rabbits, chicks, small lambs and birds are usually brought in for both boys and girls. A creepy-crawly petting zoo could consist of lizards, turtles, spiders, frogs and snakes. Parties can also be held at the actual petting zoo. If you live near a ranch, farm or park with a petting zoo, call to make arrangements to visit. Not only does this keep your yard from becoming crazy with onlookers, but you do not have to invest as much in decorating or prior cleaning. A longer presentation and more animals might be available at an actual petting zoo, versus what can travel to your home. Licensing and Insurance: USDA certification is necessary for all petting zoos. Make sure the company's liability insurance is up to date. Cost: A deposit is usually required for both types of parties. Costs will likely range between 250 and 500+ dollars for a party lasting an hour or two. Cancellation Notice: Some petting zoos will operate in wet weather, so be sure you can pay the entire fee even if you cancel. Others may not allow you to cancel without 24 hours notice. Family Pets (mobile zoos): Most mobile petting zoos will ask that your family pets be contained inside or in an area away from their animals for safety reasons. Food and Drink Policy: Mobile zoos may not want you to serve food and drink while animals are being handled. Petting zoos you visit might offer picnic facilities or more for your party goers to use. Ask when you book the party. The costs for renting a birthday space at a petting zoo or having one come to you might be out of your budget. If this is your situation, you still may be able to have a petting zoo party using a few birthday party ideas. Use family pets for animals. Puppies, kittens, hamsters, mice and guinea pigs can all be brought to the same area for a petting zoo experience. Ask a close friend or relative to let you use their farm. If you know someone with a farm or ranch, ask if you can host the party at their house. They can give the kids a tour of the farm and then let them pet their domesticated animals. Set up a faux petting zoo. Toddlers and preschoolers might get a kick out of actually making the zoo themselves. Ask each child to bring a stuffed zoo animal to the party in the invitations. Once kids arrive, help them set up their own petting zoo! Games and activities are always a big hit at any birthday party. Horse lovers might get a kick out of making a horse bracelet or painting ponies to take home. After the petting zoo, games and activities, have birthday cake, snacks and drinks for the kids. You could also choose to hand out cow frosted cookies instead of cake to children.